We are offering Conventional Steel Structures to our respected customers which are situated all round the nation. Among our wide range of products, we are offering a premium quality assortment of Steel Structure. We provide various high quality steel structures for industrial and commercial building. They are fabricated with both mild steel tubes and structural steel. Offered in various types these structures are tailor made to customer requirements. Precision engineered, this are highly accurate in dimensions. 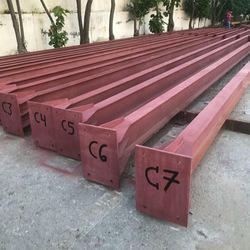 We are dedicated with offering a wide ranges of Conventional Steel Structure that is made using best grade raw materials and leading-edge technologies to be sure its long lasting performances and durability. We are instrumental in undertaking projects for constructing Conventional Structures. Our professionals make sure to execute the undertaken projects as per the highest of standards as well as . Location : Srirangapatna, Mandya Dist.